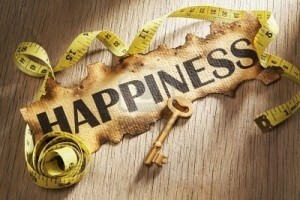 A basic desire of all people everywhere, whether they are Christians or not, is to be happy. Everyone wants to be content and satisfied. The men that I spend time with and know all want to be successful at what they put their hands to do. The women I know want their marriages and families to be successful. Jesus even promises in one of his first teachings in Matthew 5-7 that if you follow him that you would be happy and fulfilled. The first psalm begins this way, â€œhappy is the man who. . .â€ God promises joy and peace to those who meditate on His Word. So the question is then, â€œHow will one find happiness?â€ The world promises happiness in many things â€“ possessions, popularity, position, prestige, promotions, physical relationships. The Bible teaches that true contentment will be found in enjoying God Himself. Happiness is not determined by where one works but by where and how one worships. Not by external circumstances but by the internal contentment we find only in the Lord. Not by finances or fame, but by faith in God. Christ is the source of eternal joy and everlasting happiness. So mankind is faced with the same decision that Adam and Eve faced in the garden; will we listen to and trust the Lord or will we listen to and trust the serpent? 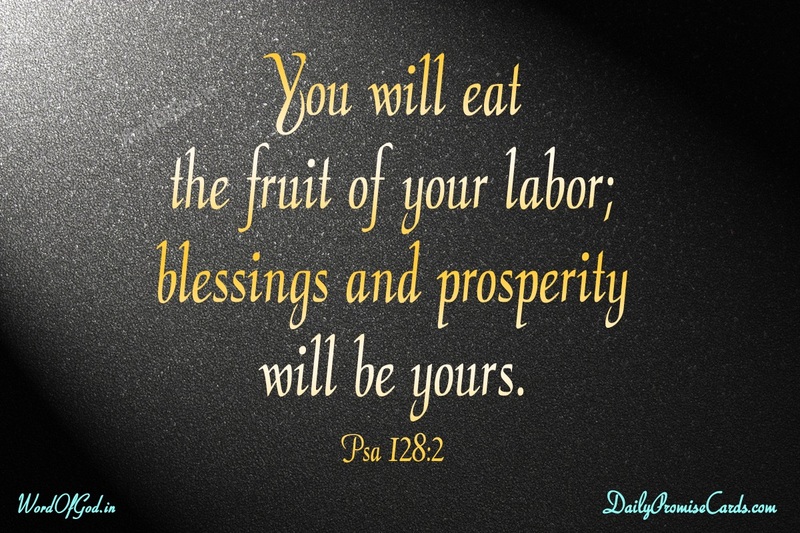 God said, â€œIf you eat of the fruit you will surely die.â€ The serpent said, â€œYou will not die.â€ God says, â€œtrust and follow Me, find your happiness and joy in Me.â€ But the serpent says, â€œCome on letâ€™s play.â€ Psalm 128 says everyone who follows God will be blessed â€“ so who will you trust? Who will you follow? If we trust and follow the world while trying to follow Jesus itâ€™s like being married to someone an seeking to have a meaningful and genuine marriage, while at the same time having an affair with someone else â€“ it just doesnâ€™t work. So letâ€™s break down Psalm 128 and see how we can be happy. To be blessed is to have divine favor. We see in many passages what when Godâ€™s people are blessed, it is talking about long life, things going well for them, provision for their needs, joy and peace, salvation (not to mention all the things that result from salvation) â€“ the list goes on and on. So First, the Lord wants to bless His people, and to be blessed is the main message of the Psalms and this blessing begins with the person who fears the Lord. What does it mean to fear the Lord? In Deuteronomy 5:28-29 we find Godâ€™s people and they have escaped slavery in Egypt, and have been led to a mountain where God displays His glory. It scares the people and so they ask for Moses to go and speak on their behalf. He does, then comes back and says. The person who fears the Lord takes God seriously. He reverences him deeply, and honors Him greatly.Â Keeping Godâ€™s commands begins and comes from our fear of Him. Later when we see and get to know Jesus, our obedience comes from our love for Him, and a desire to please Him. But we begin to understand God when we fear Him â€“ for He is mighty. To â€œwalk in the ways of the Lord,â€ is to live in daily obedience to the Word and will of God. No one will truly be happy while living in disobedience to God. Only in walking in Godâ€™s ways will he be truly satisfied and content. Think of the person who continually breaks the law â€“ we would call them a criminal. What is their life like? Instead of investing time in hard work or an education they take shortcuts and steal, con, or rob by force. They live in constant fear of being caught, or killed, and if they are arrested they lose their freedom by going to jail. Prison is full of horrible actions of itâ€™s own. If they make it through prison and live, then when they are released, where they will have a hard time getting a job (because they are a convict). And on and on the cycle continues. Wouldnâ€™t it be an easier life for this person had they just followed the law? God has established laws and commandments that are there because He loves us and wants whatâ€™s best for us. God doesnâ€™t want us just to live â€“ He wants to give us a long life. He doesnâ€™t want us to just make it, He wants to bless what we put our hands to do. God doesnâ€™t just want us to have a family â€“ He wants it to be a place of peace and love, and blessing for everyone. He wants our legacy to be a long life that is able to reflect upon and see how it has grown and blessed the name of the Lord. 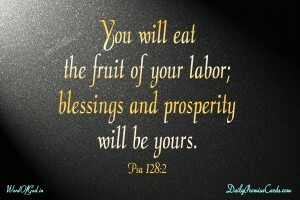 This God-blessed man will eat the fruit of his labor. The people around you will see it. Psalm 58:11 says, â€œMankind will say, â€œSurely there is a reward for the righteous; surely there is a God who judges on earth.â€ Heavenâ€™s favor will be upon his work, his labor will be graced by God, his endeavors will be fruitful and rewarded, but only in the extent that God chooses to bless, which is either in this life or in the world to come. How many times have we tried to do something completely in our own effort and our own wisdom â€“ apart from seeking God and following His ways, only to have those things fail? Or even if they do succeed from a worldly perspective when itâ€™s all said and done there is no joy and happiness â€“ no fulfillment for our hard work. 3Â Your wife will be like a fruitful vine within your house; your children will be like olive shoots around your table. Olive trees, common in the Middle East, take time to mature and become profitable. When the shoots (small beginning plants) are patiently cultivated, they produce a crop for many years. When oneâ€™s children are rightly nurtured over time, they will become productive and prolific for God. They will know Godâ€™s blessing, a grace that will further come back to bless the parents. The idea is that what a godly man, or a godly woman, or godly family nurture, the thing they bend down and protect, water, feed, put their effort into, the Lord will bless and they will see how the Lord is moving and God will bless this ministry, this action that brings God glory, and will be able to see how it multiplies. What are the things that you pour you familyâ€™s resources into? What are the things that you defend and carve out time for? What do you feed and cultivate in your family? What is your family together working toward? Is this activity and investment bringing glory to God? If not, then it will be like chaff and bow away, and forgotten. 4Â Behold, thus shall the man be blessed who fears the Lord. This phrase is repeated (v.1) â€“ if a person fears the Lord, he will be blessed â€“ and the word â€œbeholdâ€ is added for emphasis. Other translations say, â€œlo, look, this is how, thusâ€ and they all have the idea of stop what you are doing, and observe what has just been said â€“ itâ€™s important. If you trust and follow God (with your whole heart) you will be blessed. In the summer of my junior year of college I felt led to be a summer missionary in Ocean City, Maryland. Terry Davis was the pastor of Ocean City Baptist Church, and his wife Lynn was a missionary with the Baptist Convention of Maryland/Delaware. Together they planted the church there, and have had hundreds and hundreds of short term missionaries over the 20 or more years they have been there. They have started many campground ministries, and have reached many, many people for the Lord. They have built buildings, started a Christian school, and all three of their children are in some type of ministry. Their daughter has married and their family has planted another church that is doing similar ministries in Delaware, and one of their sons is no the pastor of this church original church plant. The Lord blesses Lynn and Terry. Because they fear the Lord and seek to walk in His ways, their ministries have grown, their children are multiplying their efforts, their home is a place of ministry and peace, and each year that goes by it is more and more of a blessing for them. They have had troubles and obstacles to overcome, but they still remain. They are not rich people, and they are not famous people. They are not powerful people â€“ but they are greatly blessed. This psalm is a picture of a person putting down shoots of a plant â€“ bending down, putting their hands in the soil. Tenderly and carefully planting the shoot — which is hard backbreaking work. It requires that the plants be protected, cultivated, pruned, and a lot of sweat will go into the work. Hours and hours of time will be invested in the effort, and there will be times when the olive tree farmer has to wait â€“ God says, that if you trust Him, there will be a harvest. Along the way will be storms where branches will get knocked off. Hail will fall from the sky and damage the plants. There may even be a season or two that goes by where there seems to be no growth at all. Drought will cause the plant to grow slowly. The planter has to wait on the Lord, not the plant. 5Â The Lord bless you from Zion! May you see the prosperity of Jerusalem all the days of your life! 6Â May you see your children’s children! Peace be upon Israel! â€œfrom Zionâ€ is the place where the divine glory most resides, the center from which all our blessings flow (Ps. 20:2). It is from the place where God dwells that true blessings come. Who is the psalmist talking to? Who is he saying these things to? â€œThe Lord bless you from Zion!â€ whoâ€™s the you? I believe that David was writing to those whose heartâ€™s desire is to fear the Lord, and walk in His ways. To those people David prays to the Lord and asks God to bless them. We have the same choice as Adam and Eve â€“ do we trust God, or do we trust the serpent and his lies. 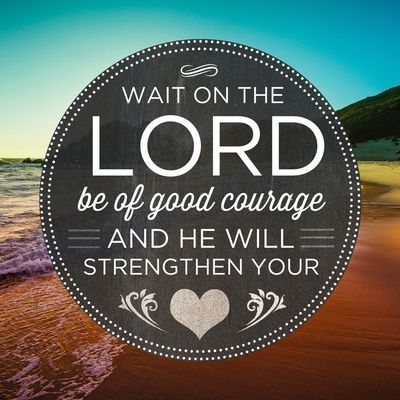 Do we wait on the Lord, and trust Him. Whether you are just planting the shoots, have seen your plants go through storms, or are enjoying the fruit of your labor â€“ we must trust the Lord. When you do, peace will come.